simplecall offers a top quality PINless calling service that is not only cheap but also convenient and hassle-free. It might interest you to know that we have competitively cheap rates and our additional services and features come free of charge with our service. You even have full access to your online call history at all times. 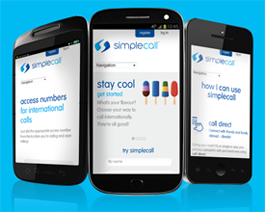 Because simplecall is PINless, you won't have to go through the hassle of dialling complicated PINs and card codes. All you have to do is just pick up the phone and start making calls – that’s really how simple it is! To enjoy all the benefits and features for the cheapest cost, please visit our website www.simplecall.com and register for free. Our rate for Nigeria starts at 9.53¢ /min for landline and mobiles. There are no hidden charges and you only ever pay for what you use. Our aim is to provide a genuinely low rate for making international calls to Nigeria. Your satisfaction is always what matters most to us. Nigeria is Africa’s most populous nation and it is the powerhouse of Africa. Most Nigerians speak in Igbo, Yoruba and Hausa and they are the largest ethnic groups in the country. A large contingent of Nigerians currently live in the USA and their contribution to the local economy is immensely important. Nigerians national football team is dubbed as “Super Eagle” and is closely followed by Nigerians around the globe.